Hello folks, welcome. Last year, I backed the second printing of the game Gloomhaven which, if you didn’t know, is a monster of a fantasy adventure game that I did an unboxing video of earlier this year which you can view HERE. I’d been wanting to play this game for a while however the immense nature of the campaign combined with the infrequency that I can play boardgames and the volume of other games I and my group have between us means that it has sat in my games cupboard for near 6 months doing nothing. And then a couple weeks back I was chatting to my mate Barry who runs DnD for me and he happened to mention that he and his other pal were really wanting to play it but it was only for sale at ridiculous prices on Ebay. So, I made a tough decision. I sold it to him (at a price to cover the KS cost but not the exorbitant rates on EBay) knowing that it would at least get played and that I might get at least some opportunity to play at his house. I traveled the 70 odd miles to Edinburgh where he lives early last week, lugging Gloomhaven and we had a Gloomhaven weekend. This post is about that. Barry chose the Cragheart character, a rocky earth elemental thing. Being a fan of Planet Hulk and Thor: Ragnarok he decided to name his Cragheart “Korg”. I chose the Vermling Mindthief, a sort of Rat Goblin thing that has some psionic abilities, including summoning rat swarms. For the sake of comedy, I named my character “Meik” (also from Thor: Ragnarok and Planet Hulk). So, each player starts with a combat deck, some money to buy basic gear and a starting hand of cards. Each player then chose their main quest, the reason their character has for adventuring in the first place and the game starts. There was a Story introducing us to the game and it set up the first scenario, whereby we were hired to retrieve stolen documents for a lady. We cracked some skulls and found the bandit lair. The lair was Game 1. Scenario 2 directly linked to the first and was the inner chamber of the Black Barrow. We advanced on the first room of guards, making good headway without burning through our decks quite so quickly. We learned our lesson in the first game. After clearing the room, Korg and Meik hurried into the main chamber to confront the boss. Elohaen was still playing rather relaxed and was miles behind us. This proved to be problematic. The boss was in the room, a Bandit Commander, with some guards. Unfortunately, the boss had two special abilities. One which teleported him to a nearby door which he then opened (there were 4 in all), revealing enemy reinforcements inside. Or he summoned some Living Bones to fight us. Korg and Meik had no choice but to hurry into the room as if left alone, the Boss would spawn a legion of enemies and we would drown in opponents. Korg confronted the boss whilst Meik became a murderball on his guards. Elohaen slowly advanced towards the central chamber. ( He was the main healer and had hung back way too far unfortunately). Regardless, Korg, Meik and the Rats battled on. The Rats, as ever, did their part well of distracting and munching whilst Korg and Meik were able to lock down the boss long enough to bring him down. Unfortunately, with no healing, Meik got battered quite badly having to burn cards to remain standing. However, we were victorious and retrieved the missing documents returning to Gloomhaven unlocking multiple locations on the map as a result. We played 2 more games that day (for a total of about 9 hours) however I am not going to recount them here as there are spoilers to the campaign if I did. Suffice it to say, Meik is now nearly level 3 and fully kitted out and in the most recent game came close to dropping but still managed to get back to full health without the help of a healer. 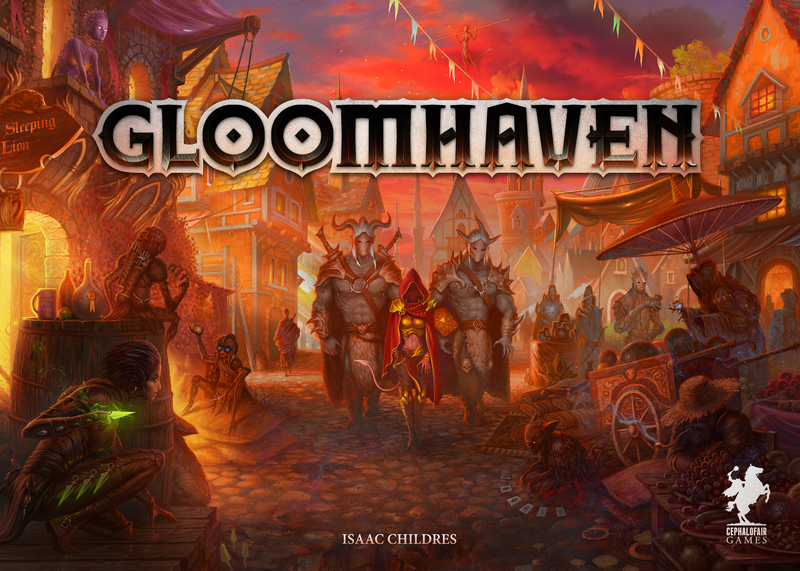 This game is a lot of fun, taking the standard dungeon delve type game and then taking it to a whole new level, unlocked locations appearing on the map as stickers and the prosperity of the town of Gloomhaven increasing as you play meaning that eventually we are going to unlock better shop items. I am a tiny bit disappointed it is no longer my game, but at least it will get played and I will get to play it from time to time. Perhaps I will play it enough to complete my mission and unlock a new character to play? Hopefully! Great game. If you get a chance, it’s worth your time.